Well, our weather luck ran out. 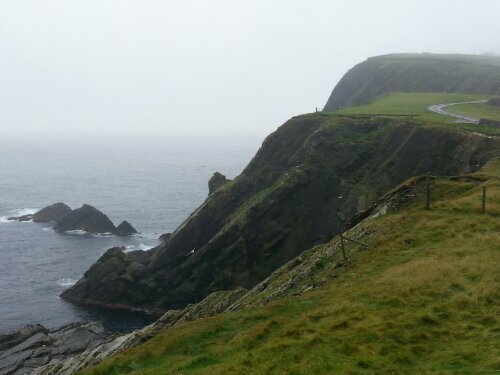 Our day in the Shetlands proved to be dank and dreary. I know that you’re probably thinking that we’ve had rain everyday; and we have. But it also cleared up every day… until today. No worries though. We still had a great time! Today we had made plans with friends that we are traveling with to rent a van. As two of the friends are Scottish, they would handle driving on the “correct” side of the road for us. Before anything though we had to clear U.K. immigration. Then we had to tender to the pier. At least once there things were easy. Just picked up the van right at the dock and we were off. Oh, it was a cheap option as well. About £12 per person including gas (or should I say “petrol”). Our knowledgeable driver took us south, all the way to Sumburgh Head. That in itself was interesting as we had to stop for a few minutes when a plane was taking off, as the runway crosses the road in Sumburgh Head! To and from we hit scenic points like the Croft House Museum in Boddam which was an example of how Shetlanders lived 150 years ago. 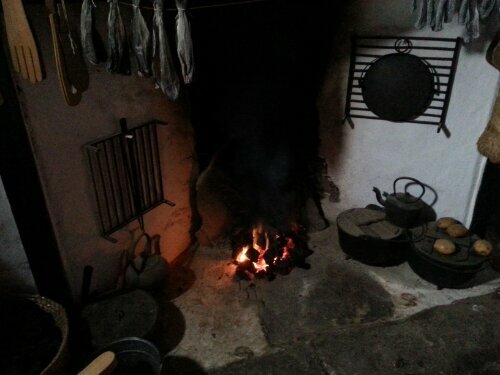 It was very interesting, and the first time I’ve seen or smelled a peat fire. The person who worked there was very friendly and knowledgeable. And it’s something to do that is free! A stop at a visitors centre yielded me my fridge magnet, so all was right there! I had been concerned that by not doing a tour we wouldn’t see any of the Islands famous ponies, but we saw several on our drive, not to mention a ton of sheep. 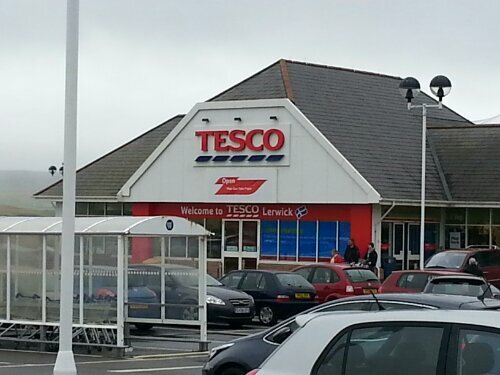 As this was our “cheap” stop, on our way back to Lerwick we stopped at a Tesco to get provisions. 99p for a 6 pack of bottled water is a far cry from the €5.50 I paid for one bottle yesterday in Alesund! Back in Lerwick, we went to a hole-in-the-wall pub simply called The Lounge for Scottish Ale. In this case we had White Wife, an ale actually made in the Shetlands. After that we walked around before poking our heads into a fish and chip shop right across the street from the port. Our friend bought fried haggis for everyone to try. I passed, but DH tried it and liked it. I stuck with the cup of chips I bought, liberally sprinkled with malt vinegar. On to the Faroe Islands tomorrow!